Why Vote? You Fill in the Blank! Why vote? You fill in the blank! Starting next week, Associated Students will be setting up voter registration tables all over campus. 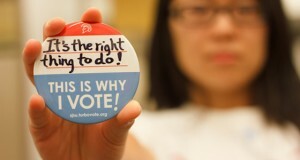 Pick up your button, fill out the paperwork or get it done right now with Turbovote (Christina Olivas photo). How easy is it to register to vote in this November’s election? So easy you can do just about everything right now on your smartphone! TurboVote makes the whole process as easy as renting a DVD from Netflix, plus the service will send text and email reminders so that you don’t miss elections. You fill out a form online, and then TurboVote mails you a completed vote-by-mail application or registration form along with a pre-addressed, stamped envelope. This comes at no cost to Spartans, thanks to support from the Associated Students of SJSU and the SJSU Office of Public Affairs. Or look for the Associated Student tables across campus where you can register, get your button expressing “Why I Vote,” and sign banners with the issues that are important to you. Volunteers will be available to help from the beginning of the semester until Oct. 22, the last day to register for November’s general election. Whether you simply think it’s the right thing to do or you want to put an end to the tuition increases that come with SJSU budget cuts, now is the time to take that first step. Register today. Fantastic weather greeted new students at the Fall Welcome Days Kick-Off Aug. 21 on Tower Lawn. 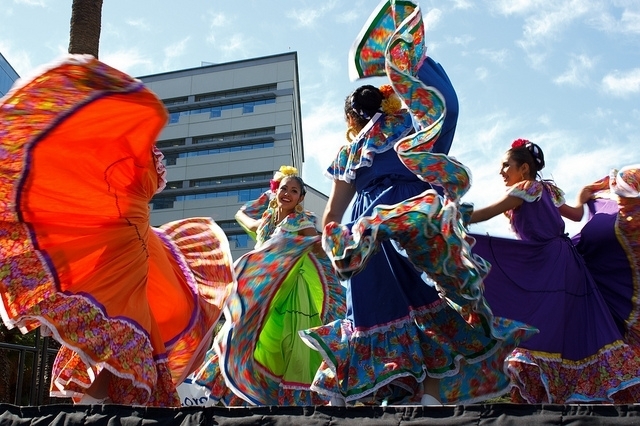 A folklorico group was among the entertainers at the event (Christina Olivas photo). What’s the roar coming from downtown San Jose? 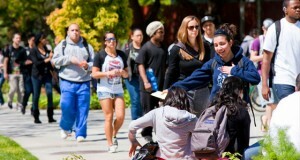 That’s the sound of 30,500 Spartans heading to campus for fall 2012! As usual, the academic year began with fantastic weather. During the sunny but cool afternoon of Aug. 21, new students crowded Tower Lawn for the Fall Welcome Days Kick-Off. 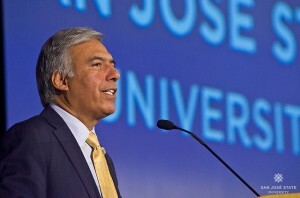 The event was SJSU’s way of welcoming 3,445 first-time freshmen, 3,370 new community college transfers and 1,900 new graduate students to campus, very close to matching last year’s grand total. With music booming, students ate ice cream, lined up for caricatures and took a ride down giant inflatable slides while meeting new people and learning about SJSU organizations and departments. The next day, thousands of Spartans flooded campus for the first day of classes, searching for parking and perhaps hoping to drop/add a course or two. The most obvious change was tremendous progress on the construction of the new Student Union. When students left for the summer, there was little more than a foundation. Now you can see the curvy exterior of the western expansion near the Music Building and a tiered theater taking shape near the Business Tower. The Spartan Bookstore was crowded with students, who can now charge up to $900 in books and supplies on their Tower Cards. Meanwhile, the University Library is making it easier than ever to borrow textbooks. Over at South Campus, Spartan Football has been practicing since late summer for its season opener at Stanford 7 p.m. Aug. 31, led by starting quarterback David Fales and supported by the SJSU Cheer Team (Christina Olivas photo). Even before stepping on campus, everyone experienced downtown San Jose’s newest traffic features: 7.6 miles of buffered bicycle lanes on Third, Fourth, 10th and 11th streets. Yes, it’s confusing but the city of San Jose is offering more info on how to navigate the bike lanes, intended to make things safer for everyone. Another option is to live on campus. Almost 3,600 students have moved in, including all freshmen required to bunk in the bricks, Joe West Hall or Campus Village. Over at South Campus, Spartan Football has been practicing since late summer for its season opener at Stanford 7 p.m. Aug. 31, led by starting quarterback David Fales. Of course what matters most is what students find in the classroom — expect change! 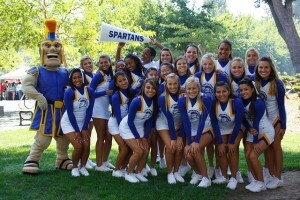 Among SJSU’s key hires over the summer was Dr. Catheryn Cheal. The new associate vice president and senior academic technology officer, she is charged with helping the faculty explore online teaching. Another new face is Lisa Vollendorf, who came from CSU Long Beach to become dean of our College of Humanities and the Arts. Among the many faculty members heading back with new books is Professor Randall Stross, author of The Launch Pad: Inside Y Combinator, Silicon Valley’s Most Exclusive School for Startups. Innovation was the theme of President Mohammad Qayoumi’s Fall Welcome Address, an annual tradition held this year on Aug. 20 in Morris Dailey Auditorium (Robert Bain photo). Innovation was a theme of President Mohammad Qayoumi’s Fall Welcome Address, an annual tradition at SJSU held Aug. 20 this year. After taking the podium, Qayoumi wasted no time in getting right to the point — everyone’s worried about the budget. Will tuition go up? Will jobs be cut? What can you do? Attend the next budget forum Sept. 10 and make a difference by voting in the November elections, especially on Proposition 30. Not registered? No problem! 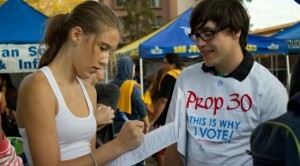 In the next week or so, you should see voter registration booths popping up all over campus. Associated Students will help people register in person or online at TurboVote, which makes the whole process as easy as ordering a DVD on NetFlix. And should you have trouble finding your way around, look for the “Ask Me” booths at all the main entrances to campus, a great example of Spartans helping Spartans. SJSU has been buzzing with political energy after Bill Clinton, Sarah Palin and Jerry Brown visited San Jose last month. We asked Spartans why they plan on voting in the Nov. 2 general elections. At a Sunday night rally for the California Democratic ticket at San Jose State University,former President Bill Clinton urged young people to vote or risk paying more to repay their student loans. While Clinton was there to stump for Democratic gubernatorial candidate Jerry Brown and lieutenant governor hopeful Gavin Newsom,he aimed much of his 30-minute message at a national audience, particularly young people and people of color. Insiders are worried about low turnout for both groups, which were a major part of the 1.1 million Californians who voted for the first time in the 2008 presidential election for President Obama. Clinton said if Republicans take Congress in the Nov. 2 midterm elections, their priorities will include a move that could increase the cost of federal student loans by rescinding a provision in the program. It was the last lap on a three-day barnstorming tour through California for Clinton, which started with an outdoor rally Friday in Los Angeles with Brown and Newsom. It concluded Sunday with an afternoon rally in Napa for Democratic Rep. Mike Thompson and the 8:15 p.m. appearance in San Jose. Clinton, Brown and Newsom all talked up how Democrats would be the ones to keep California at the forefront of green jobs growth domestically. And Brown took digs at his GOP opponent,Meg Whitman,the billionaire former eBay CEO,who has invested more than $141 million of her own money in the race. “We’ve found out a billion is not enough if that’s all you got,” Brown said. Sunday’s event could have made for one of the more awkward onstage political hugs in recent memory as Newsom,Brown and Clinton haven’t always been on the best of terms. Clinton and Brown exchanged caustic barbs when they ran against each other for the 1992 Democratic presidential nomination. That feud resurfaced several weeks ago when Whitman’s campaign began running a commercial showing Clinton tearing into Brown during a 1992 debate – an ad that contained erroneous information about Brown’s record on taxes as governor. Brown retorted with an offhand remark about Clinton’s affair with White House intern Monica Lewinsky. Before the dustup got too intense, Clinton endorsed Brown and made plans for the California visit. Clinton endorsed Newsom over Brown last fall, a payback for Newsom endorsing Hillary Rodham Clinton over Obama in the 2008 presidential primary. At the time,campaign operatives for Brown and Newsom were trading punches almost daily – until Newsom dropped out of the race nearly a year ago. But Clinton wrapped a bear hug around Brown after the California attorney general introduced him. A spokesperson for Whitman’s campaign,Andrea Jones Rivera, scoffed at Clinton’s appearance. “If it weren’t for his party affiliation, Bill Clinton wouldn’t have anything to do with Jerry Brown. This entire appearance is about party politics,” said Rivera. Nicole Gomez, a San Jose State student at her first political rally,was undecided about how to vote on Proposition 23, which would gut California’s landmark climate change law. But after hearing Newsom talk about how damaging it could be, she will now oppose it and support Newsom and Brown. “I’m definitely not voting for Meg Whitman,” she said. President Bill Clinton, Attorney General Jerry Brown and San Francisco Mayor Gavin Newsom will attend a California Democratic Party rally beginning at 7:30 p.m. Oct. 17 in the SJSU Event Center. This event is free and open to the public, but advance registration is required. Members of the media only should contact Christina Iskandar at Christina@kasselman.com or 714-403-9661 for more information. There’s an election in California, but will the Democratic voters show up? Tarah Al-Haise was into “the whole presidential thing” when Barack Obama was elected president two years ago. Yet with next month’s elections looming, nothing on the ballot inspires the junior psychology major at San Jose State University to persuade her to vote. She knows plenty of students who feel the same way. Everyone but her friend Maria Makarian, 21, who not only will enthusiastically cast her ballot, but worries that she may be in the minority. Anything can happen this election, but the youthful tidal wave that helped sweep Obama into the White House in 2008 may have dried up. With Barbara Boxer holding a slight lead over former Hewlett-Packard CEO Carly Fiorina, there’s a chance California may not get socked by anti-incumbent fever as badly as other states, but there’s no question — many Democrats are struggling to find a reason to vote. Traditionally, voter turnout is low for midterm elections when there is no presidential candidate or compelling issue on the ballot, and the state appears headed that way this time. Nearly 14 percent more Democrats than Republicans are registered to vote in the state, which should give them the edge, but GOP leaders said they’re seeing an excitement and enthusiasm in their party members they haven’t seen in years. If early exit polling in the East shows GOP wins, “Democrats will be discouraged” here and might not vote, he said. That kind of negativity, too, affects voter turnout, Baldassare said. “When people are given a lot of reasons not to vote for the other person, it encourages people not to participate,” he said. Claire Conlon, executive director of California Young Democrats, and Alex Wara, president of the Democratic Caucus at San Jose State, said they believe students do care — about the environment, about higher education, about the military’s “don’t ask, don’t tell” policy. When they learned that former President Bill Clinton would be appearing at San Jose State on Sunday with Jerry Brown to help boost support for the candidate in the governor’s race, Conlon said a request was put out for 40 volunteers to help with the crowds and whatever needed to be done — and they got 150 volunteers. “Peer to peer. They’ll turn out to vote if their peers ask them to,” she said. Thinking about the upcoming generation is what motivates Manuel Perez, 66, of San Jose, to vote. Like many Latinos, he said he resents the backlash against illegal immigrants. What matters now, he said, is to keep pushing forward, no matter what. More than anything, he said, it’s now about having a better world for his six grandkids.